A teenage filmmaker befriends a classmate with cancer. THE REVIEW: This film was a big hit at the Sundance Film Festival taking home both the U.S. Grand Jury Prize and the Audience Award. Going into the film I certainly heard a lot of hype from people who had seen it at Sundance and raved about it as one of the best films of the year. After watching it myself, I can certainly see where all the praise is coming from, but I’m not quite as enthusiastic and effusive as others are. Let me start by saying that I enjoyed this film. It is quirky, odd, and endearing in a way that only a smaller indie film can be. These traits are both why I love the film and why I’m hesitant about giving it my full-on stamp of approval. Me and Earl and the Dying Girl starts off as a zany comedy with weird stop-motion animations and an aesthetic out of a Wes Anderson film. Except for the part where Nick Offerman plays Nick Offerman (he’s actually Greg’s Dad, but he could be credited as Himself), I didn’t laugh a lot and I just found myself confused as to what film I was watching and what the whole point was supposed to be. Throw in some out-of-the-box cinematography and I was left shaking my head for a long portion of the film just hoping it would get better at some point. To go off on the cinematography for a bit, as that is where most of my disagreements stem from, it wasn’t necessarily the framing that upset me but rather the constant movement of the camera in ways that left you feeling seasick. Camera movement is generally great and can help spice up a scene and give it an energy it otherwise lacks. Movement can help direct the viewer’s attention and incorporate new characters and set pieces without having to make a whole slew of cuts with insert shots and cutaways to get to the same point. In Me and Earl though, there was a swish-pan and a dolly move in every shot for the first five or ten minutes. The resulting effect was increased confusion as I had little idea what was going on. Greg Gaines (Thomas Mann) begins the film writing an essay on his computer while narrating it for the audience as we flashback to watch the events unfold. A great way to introduce us to everyone (I especially enjoyed the chapter headings and title cards throughout the film), but much of the execution was lost in a sea of loosey-goosey camera moves. There came a point in the film though where the camera settled down (for the most part), the bizarre and quirky nature of the film became commonplace, and you really got lost in the characters and the story. This is where the film shines and rightly so. It is a story about friendship, love, and loss. Greg is the high school senior who has remained invisible and has few true friends and Rachel Kushner (Olivia Cooke) has recently been diagnosed with leukemia. The two become close and form a friendship that often feels distant and forced. Greg was forced by his mother to hang out with the Dying Girl and Rachel initially rejects his offer of a pity friendship just because she has leukemia. What makes Me and Earl and the Dying Girl really stand out is the subtlety and the gradual pull the film has on your attention and emotions. It all happens so slowly that it’s hard to pinpoint an exact moment where I went from, “What’s going on with the camera and these wacky animations,” to utter speechlessness. A definitive marker comes at a scene about two-thirds of the way into the film where Greg casually asks Rachel to prom, but there’s so much that happens before that scene that prepares you for it. The film takes such a turn and completely stunned me in a way I couldn’t have anticipated. Whether as a result of editing or the carefully crafted story, I’m not sure. What I am sure about is the impact this film has is tremendous. THE TAKEAWAY: If I had to describe this film, the first two words I’d use are “odd” and “wacky” followed closely by “touching” and “heartfelt”. Initially I thought that if only the film was more of a standard comedy-drama à la similar young-adult fare like The Fault in Our Stars, I would unabashedly recommend this to everyone I met. While I still partially believe that and wish the film wasn’t so far out of left field, I’ve started to come around a bit. Me and Earl and the Dying Girl is unique and embraces its weirdness. To change that in favor of a more “normal” film might make the movie more palatable as a whole, but it would also lose the essence of what makes it special. 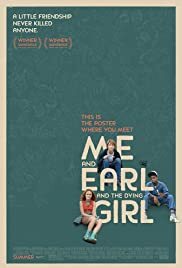 This film has plenty of things I felt could be improved, but those warts are ingrained in the DNA of Me and Earl and the Dying Girl and without them, it wouldn’t be the same film. Me and Earl and the Dying Girl opens in limited release on June 12, 2015.